But why are we starting with this before we've even covered flat pattern adjustments? Good question! Basically, covering fabrics first gives you plenty of time to consider your options and to gather your supplies. It also means that as soon as you've got your fabric, you can wash it (go on! Do it! Pop it in the wash you're about to do with similar colours. This will pre-shrink your fabric so you have no nasty fitting surprises when you wash your finished garment for the first time. If you're going with an underlining option to help stabilise your seams, make sure you wash this too!!). The right fabric choice for the Felicity Dress (especially the bodice) is a really important one. You really really do want to stay away from heavy fabrics with no drape for Felicity. You'll get the best Felicity dress if you at least make the bodice in a light weight fabric that drapes well. Luckily, these are probably the easiest kinds of dress fabrics to find and you probably have some in your stash already. Think lovely light cotton lawns and voiles, linen and cotton poplin. These are especially lovely fabrics to use as they are not only perfect for summer but they are easy fabrics to use if you're a beginner and depending on where you purchase your fabric, they are inexpensive and come in a huge range of prints and colours. Vintage cotton sheets would work wonderfully. If you are feeling more adventurous or want more of an evening/vintage feel to your dress, then rayons, silks and crepe de chine would all make beautiful dresses, with just the right amount of gather sitting at your neckline. Normally I don't tend to pay too much attention to fabric recommendations on patterns, mostly because if I have a fabric in my stash that I think will work perfectly for a garment, I'll use it, thank-you-very-much. BUT the main reason why you might like to take my advice (if you're so inclined) is because the gathers at the neckline can become very bulgy, bubbly and pronounced if you choose a heavy fabric or one that doesn't drape well. Like, say, a quilting cotton. But, you know me, I love breaking the sewing rules, so if you already have that perfect fabric in your stash that isn't light weight or drape-y but you're still determined to use it, who am I to say you can't? 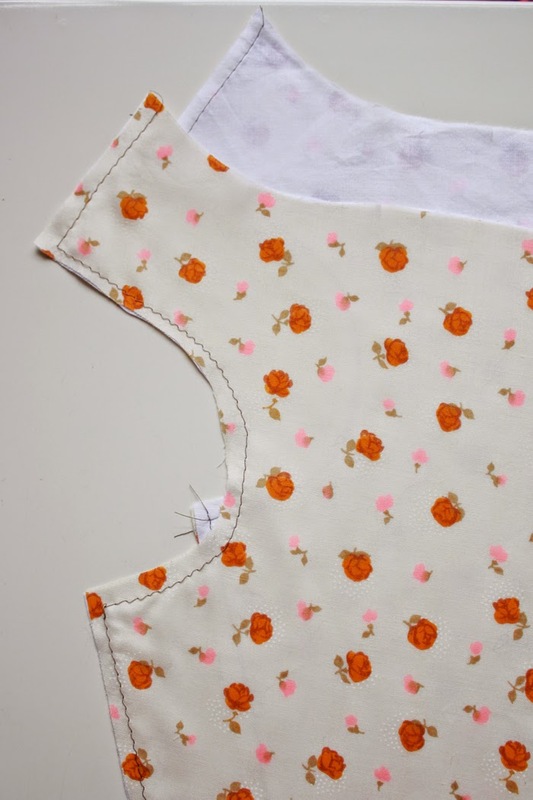 One thing you'll notice when using the light weight fabrics I recommend for Felicity (or any pattern that lists these fabrics as recommended), is that sometimes, the seams just aren't as stable as they would be with a fabric that is heavier in weight. Seams that run vertically on a body (or that will pull outwards on a body) have quite a bit of strain placed on them, for example, front and back centre seams, side seams and darts. Stabilising these seams is a good idea to ensure a long lasting garment. Seams that sit horizontally however, such as shoulder and waist seams, have much less strain put on them (they aren't being 'pulled apart' by your movement or breathing) but they still definitely benefit from being stabilised. It's completely up to you if you choose to stabilise these or not but if you're going with an underlining, they'll be stabilised any way. You can stabilise seams with some strips of light weight fusible interfacing placed where your seam would go. I would really encourage you to take this extra step if you are using rayons or slippery fabrics in general. Especially when it comes to inserting your zip a bit later on. They not only make the seams sturdier, but rayon especially, has a tendency to stretch out, and so using an interfacing should help to prevent this (or at least minimise it). In the image below, I cut strips of light weight interfacing about 2cm wide (3/4inch) and gently pressed them to my seams, on the wrong side, making sure they would cover where my stitching would be. I've only taken photos of the front bodice, but you should do the back side and centre back seams as well as the shoulder dart. I've also opted to interface my shoulder and waist seams as well, though again, it's really up to you. Another way you could think about stabilising your seams is by using an underlining. 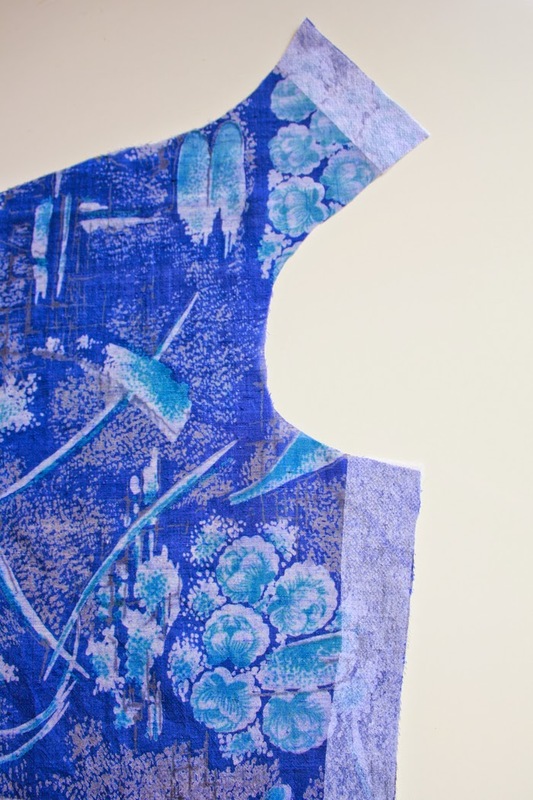 An underlining is cut from the same pattern piece as your shell fabric but in a sturdier light weight fabric (or even the same fabric as your shell, depending on what that is). The two are then basted together around the edges, within the seam allowance, wrong sides together, becoming one. This is exactly what I did for the bodice on my pink version. 1. Cut out bodice pattern pieces (both front and back, but the front is pictured here only) in your shell fabric and your underlining fabric. Make sure to mark notches etc on both the shell and underlining fabric. Note - you can cut both the shell and underlining at the same time if you wish by placing one fabric on top of the other and then placing your pattern on top. I prefer to cut them seperately though, because while it may take a bit longer, I can ensure my pattern piece is on grain and being cut more accurately if I'm only worrying about one bit of fabric at a time. 2. 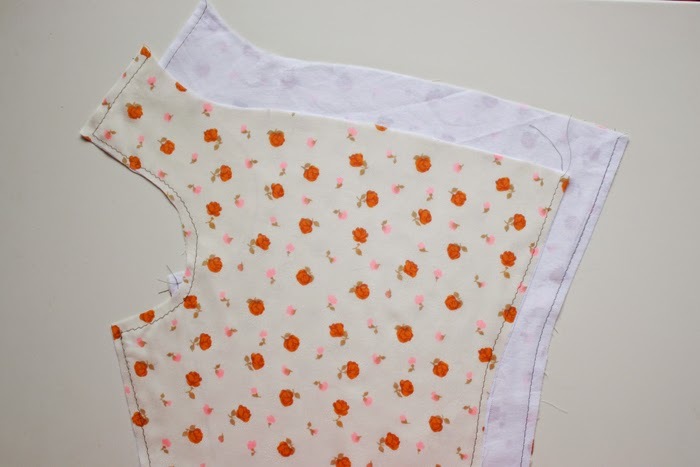 Wrong sides together, match your shell fabric with your underlining fabric and baste together around the edges (using the longest straight stitch on your sewing machine), within the seam allowance. You can use your machine to do this or you can do it by hand using a running stitch. Note - Doing it by hand will mean you are less likely to accidentally move your pattern pieces off grain as you are joining them together, but doing it by machine is faster (just use lots of pins). It's entirely up to you how you choose to do it - I did mine by machine. You'll notice I haven't basted my neckline to my underlining in the photos above. 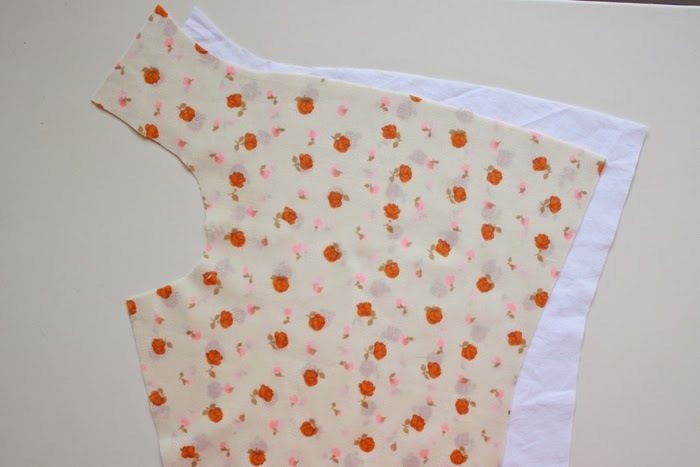 Absolutely feel free to do this, but because you need to baste along the neckline anyway once the two front bodice pieces have been joined at the centre, I decided not to do it here. I also recommend basting your Felicity arm holes to prevent stretching them out in the instructions. By basting my underlining and shell fabric together at the arm hole now, I won't need to do it when it comes time to start constructing my dress. Do be warned, if you pair two fabrics together as you are with an underlining, they will become heavier overall and so you need to be extra sure that both of your fabric choices, for the shell and the underlining, are light weight. In the example above, I'm underlining a very light weight (and quite sheer) vintage cotton with some white cotton lawn. 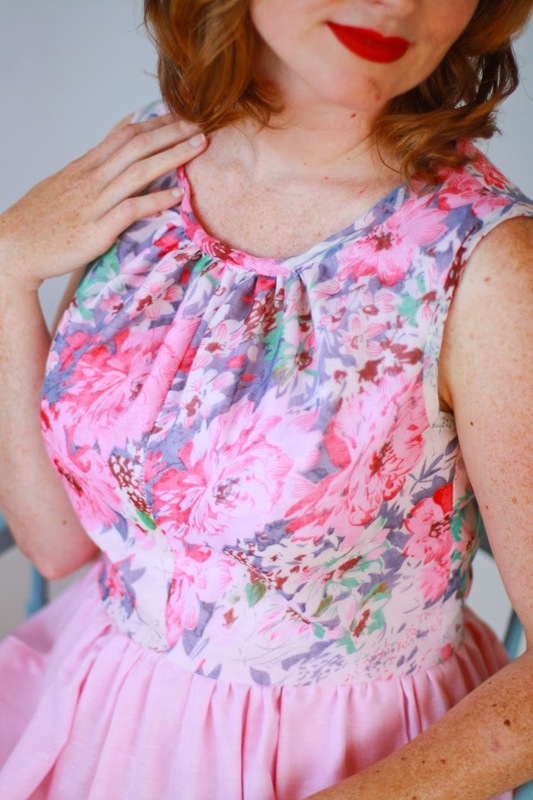 The reason I chose to underline the bodice of my pink Felicity dress is because the top floral fabric is actually see through. It's a printed muslin (or what some people call cheese cloth). The threads are woven together very loosely, resulting in a beautiful light weight fabric, with gorgeous drape, but, you know, see through and really not structurally sound to be a bodice all by itself, even with interfaced seams. Because my bodice shell fabric was so light weight, I felt confident underlining it with the pink linen I used for the skirt, and I think the result is beautiful - the pink backing makes the floral print so much more vibrant. Which is another thing underlining can do - it not only prevents see though-ness (totally a real word!) and adds structure, but it can act as a fantastic base to shell fabrics to really make their true colours shine. For reference, my green Felicity dress is made from a 100% cotton voile - just in case you were wondering. If you have any questions, feel free to pop them in the comments and I'll do my best to answer them for you. 8 comments on "The Felicity Dress Sew Along - Selecting Fabric and Stabilising Seams"
Hi Polly - because the centre seam is curved, it's not really suitable to be cut on the fold unfortunately :( It's cut like this so that there is room for the bust and for the gathers, as there are no darts in the front bodice. If you cut it straight up and down, you'd have no room for your bust. Though, you could definitely experiment to see if you could come up with something to suit you? Hi Jennifer. I made a muslin of the bodice and was wondering where the bodice should hit because it does seem a little short. Also, do you have any ideas for adding sleeves? I tried using a sleeve pattern from another dress, but it wasn't the right size. Thanks! Hi Elizabeth - the dress is designed to hit at your natural waist, but you can lengthen the bodice if it's coming up too short on you. I do go over how to do this in the instructions, but I have set aside a sew along post with pictures on how to do this - it's scheduled for the 1st April. With the sleeve, I have been working on this, but as the bodice stands, the armscye is not suitable for one (you'll end up with a tiny sleeve!). 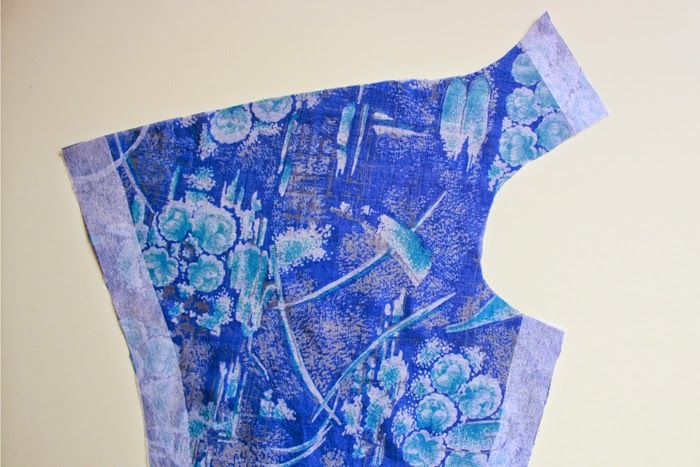 I have re-drafted the bodice for a more comfortable set-in sleeve, but I'm still working out the finer details on this. I'm doing my best, but as I initially didn't design it for a sleeve, it's pretty much meant me going back to the drafting board and starting all over again in regards to the armscye. I'm so excited to give this dress a crack, hopefully in time for Easter, but we'll see. :) I'm curious if you underlined your green dress. I'm also curious what you'd recommend for voile--if I make the whole dress in voile, and just use the same voile as an underlining, would that make it too heavy? Is the main purpose of using a different underlining simply to avoid using one's fashion fabric in an application where it won't show at all? I didn't underline the green dress and instead chose to stabilise the seams using fusible interfacing. Mostly because at the time I didn't have any underlining to hand that would work. I would have probably chosen a white voile or if I had had enough of the green fabric, would have used that as an underlining. The reasons for using a different underlining to your fashion fabric would be if your fashion fabric was like my pink bodice fabric (a very loosely woven and sheer cheese cloth with absolutely no stability what so ever! ), or if you had chosen a print and using the same print for the underlining would show through (you can see this in the floral fabric I used in this post - if I had used the same fabric for the underlining, the print would have shown through to the outside) or if you were using a shell fabric that was perhaps a bit heavier than recommended, because when you add an extra layer like you are with an underlining, you're going to be adding bulk and heaviness to the finished garment. Thanks, this does help! I appreciate the reply!